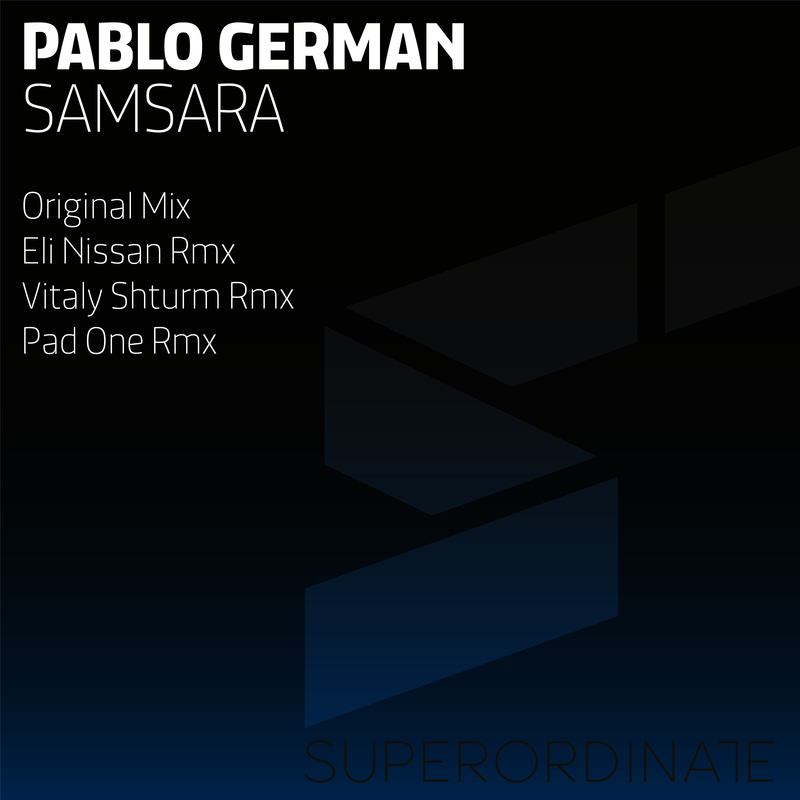 The latest release on Superordinate Music welcomes Pablo German to the label for his debut EP. The Argentinean artist has been quiet for 9 months following an appearance on Deersky’s Soundteller Records in August of last year. A fruitful winter in the studio has resulted in two brand new originals which are accompanied by remixes from Vitaly Shturn, Eli Nissan and Pad One. Pablo definitely made waves in the underground when his first productions on BCSA were released in 2013. It was the beginning of another promising career from the hotbed of progressive music that Argentina has to offer. He’s certainly delivered his career best work here beginning with the title cut ‘Samsara’. A trippy sounding number with tribal infused percussion and a billowing growl sitting at the foundation. Cross cultural themes are a borderline thing in electronic music, if not done with the right restraint or taste they come off horribly cheesy but there’s a really subtle one running through ‘Samsara’ which is quite brilliant. From a waning vocal to mystical motifs this one has it all and with exactly the right delivery. A well executed break just adds to the drama before a wall of white noise brings a rush of electronics for a magical third act. Massive work from Pablo and surely his career best. The companion piece ‘The Union’ comes in a bit more sparse but equally inspired and very musical. Backed by a stripped groove and vibrant drum elements the track methodically works its way through a maze of glassy keys and atmospheric overlays. The melodic narrative has a wonderful progression and that’s what’s most captivating here. The way the keys decay into the break is absolutely lovely and the ensuing finale is definitely one of those lost in sound moments. A magical track from Pablo. Superordinate has assembled a great cast of remixers here led by Vitaly Shturn who is making his first appearance on the label. Remixing a track as strong as ‘Samara’ is a daunting task but he’s done an excellent job and taken it into deep and groovy territory. There’s quite a nice shuffle happening here and the mystical themes are well maintained, albeit in a trippy more indistinct way. The vocals are processed quite nicely as well, acting as long decays rather than hooks while a swirling collage of atmos highlights a killer finale. Great remix from Vitaly. Next up Eli Nissan makes his first appearance on the label and provides the first remix of ‘Union’. The Israeli artist is fresh off an EP on Guy Mantzur’s Plattenbank Records and seems to showcase a fresh musicality on each and every project. He’s a great choice to remix ‘The Union’ and it’s turned out to be the most poignant piece on the release. Those trickling key clusters and warm atmospheres are magical together, while a lengthy break makes great use of tonal sustain and those tribal infused drums. What’s also quite nice is aside from a heavy groove it has it’s wonderful quirks with child-like motifs highlighting a strong finale. Excellent remix from Eli. The release concludes with Superordinate label artist Pad One making his eighth appearance. The Italian producer also takes on ‘The Union’ and comes up roses with a smooth, hypnotic rendition which caps the release off wonderfully. A chugging groove immediately strikes a progressive mood. For all of its fluid energy there’s a gorgeous story in this 10 minute journey with those choppy keys and a gorgeous break making for just two of its highlights. Good remix from Pad One and a great release on Superordinate, rivalling their all time best for sure. Highly Recommended.